All of my children have always taken lunch from home rather than buy it at their school cafeteria. We’ve always offered the option of purchasing meals at school at least once a week, but they’ve all said that what they bring from home is far better than what they could ever get from school (which was not always true – I worked in a school kitchen for over a year when we lived in Portland, and plenty of the food was very tasty and nutritious, especially from the salad bar). All our kids have thankfully always been willing to take leftovers for lunch, so with that in mind our dinners going forward will be ones that will either create leftovers, or make enough to set some aside for YaYu’s lunch. If we don’t have leftovers, we have things like chicken flautas, or macaroni and cheese that we can fix for her. She has a Thermos to carry hot food, so Brett heats the leftovers in the morning and along with some fruit and a snack, she’s good to go. We keep things as green as possible too when it comes to lunches: YaYu has a stainless steel container for the occasional sandwich, carries stainless steel cutlery from Goodwill or reusable bamboo chopsticks, we tuck in a cloth napkin, and she’ll get a third year of use out of her lunch bag this year. She also carries a 32-oz Hydroflask water bottle (that she won in a contest!) along with her for water throughout the school day, and that she refills at school for after school hydration. We actually didn’t use leftovers for her lunch today – I made inari zushi (seasoned rice in fried tofu pouches), a special treat, and we included a fresh peach, a Choco-Pie for something sweet, and a Lara bar for her afternoon snack. We’ll need lots of cucumbers from the farmer’s market this week, as well as tomatoes, but otherwise we’ll be getting fruit as we have everything else on hand. Better make it quick – when YaYu heads off to college next year, I’m hanging up my apron! How I remember the school lunch days for our four children. Now, I just pack for my husband. I always pack his lunch right after dinner while everything is still out. He has a microwave in his office. I suspected that my children never really ate their fruit or veggies I packed for them. I suspected that it was barely eaten and then tossed or not eaten at all. Then, my brother clued me in on what they did. The fruit and veggies were the after school snack, sliced on a plate or put in a small bowl. I could then “supervise” this. My children also preferred a lunch from home. In my entire life I never bought a school lunch except one day when I was substitute teaching. The school asked me to stay for the afternoon as well and paid for my lunch. When I told the teachers in the lunchroom that this was the first time, they all clapped! As I recall, it wasn’t very good–hot dogs I remember. My rule for lunches was that whatever didn’t get eaten at school was their after school snack, and they were surprisingly OK with that. But, most everything got eaten at school – their school was also very strict about swapping food (because of allergies) so that was never an issue. I always set out their lunch bags on the counter after school, and did as much of the lunch prep as possible the night before. I always enjoyed school breaks because I didn’t have to look at or think about those bags. We only got lunch from the school the last week – my mom was a teacher and was flooded with testing, grades, etc. that week and didn’t want the extra burden of making lunches for us all. When I was in the 6th grade, lunch making became my duty, and we never had lunch from school again. Our kids take a half sandwich, fruit & a treat for school lunches. I do know that the treat gets regularly traded for other things. When I have time, I bake muffins or bars or cookies for the treat part. As for a menu this week, my parents typically cook, so I’ve planned nothing! We had spaghetti & meatballs on Sunday, and yummy chicken enchiladas with guacamole yesterday (I made the guac). Who knows what’s on the agenda for the rest of the week? 😉 It’s very relaxing! I would love to have someone take over the cooking and planning for me. Brett helps quite a bit though, and has made the job easier. I has a schedule for the girls’ lunches – Monday and Thursday would be sandwiches, Tuesday soup, etc. It made things much easier, and each girl got something once or twice that was their favorite (WenYu loves sandwiches, YaYu loves soup, etc.). Our kids eat the lunch that the school provides as everyone in our school gets free lunch. They have a hot or cold option they can choose from each day. They haven’t complained about the lunches. I remember when I was in school, I ate the school lunches because my mom was one of the lunch ladies. That’s a wonderful benefit! Meiling was the only one who got to eat lunch regularly at school one year – she attended a full-day Pre-K, and we bought her lunch there – it was reasonable, and she said the food was good. I worked as a lunch lady, and loved the job. Unfortunately the custodian at the school decided I was the enemy when I began my second year, and it got to the point he threatened me. He was disciplined, but I no longer felt safe and quit. I like having a plan too – when I took a week off I didn’t Menu plan, and I felt lost. I too like a clean kitchen at night – Brett does the dishes every evening and we try not to get anything else dirty. 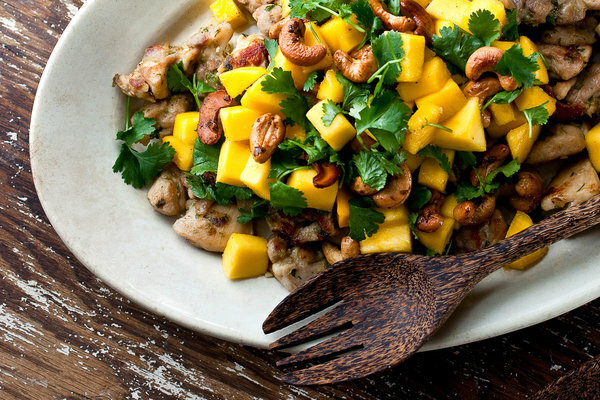 The black pepper chicken with mangos and cashews looks amazing. I definitely want to try that recipe, Laura! I know you’ve been swapping out spiralized veggies for noodles in some of your dishes, including in hiyashi chuka. I almost always use zucchini as my pasta substitute, but just saw this paleo hiyashi chuka that uses spiralized daikon. I’d never thought of using daikon that way, so am glad I came across this recipe. It’s good that she notes that blanching and chilling will get rid of the radishy taste. Thank you for the recipe! Daikon is easy to find in the farmers’ market, and we love to add it to salads. I’d never thought though about spiralizing it for hiyashi chuka, but removing the more radish-y taste would work (although we usually love the radish bite). The chicken recipe is really, really good. One tip though – have everything ready to go, chopped, etc. before you start – it goes together very fast.